Why I love Tobago 2. For our second week in Tobago we moved to the Magdalena Grand hotel, which is not far from the Coco Reef but on the exposed Atlantic coast. 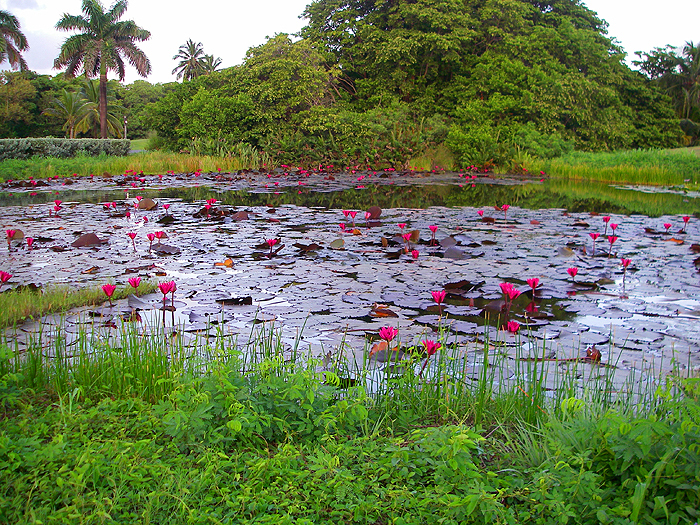 You can fish from the shore and also in fresh-water ponds, within a couple of minutes of the rooms. We hired a car so we could drive to some other favourite beaches and fishing spots. 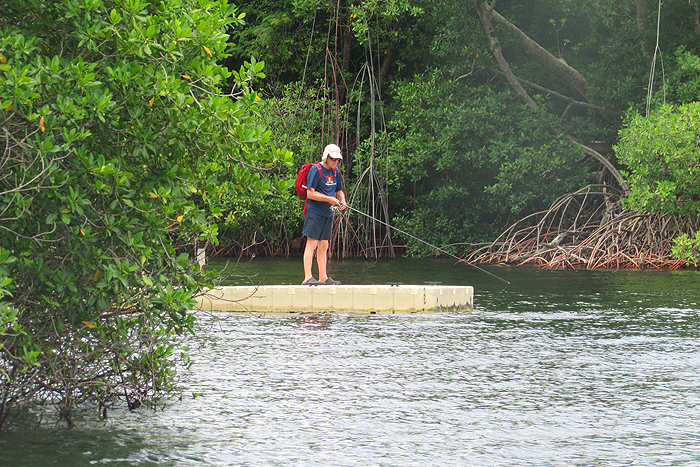 On the first morning I returned for another go at Crown Point where I’d caught my tarpon. A couple of local pals armed with both rods and hand-lines were already on the beach. We walked up and down the sand looking for blitzes which would give us the chance of a jack. Of course it is very difficult to resist continuous blind casting which does, at times, produce a good fish. However, if you can put a lure close to a blitz a take is almost guaranteed. So, if you happen to be winding in as the jacks appear it is often too late and the fish have gone before you can fire off a cast. This morning my patience paid off and the water erupted dead ahead of where I stood, bale arm open, rod poised. The Plug flew out and a second later it was seized. The rod bowed and line was pouring out at high speed. 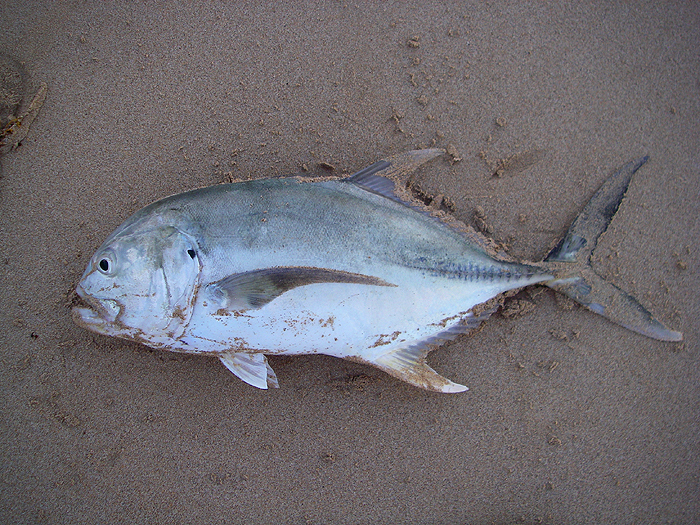 After the usual prolonged ‘screaming reel jack-battle’ a cracking 13lb crevalle was on the sand. One of the lads took my picture and I went back for breakfast. Over the next couple of days the hotel beach was unfishable with weed and I couldn’t buy a bite in the ponds (I’ve had good snook and tarpon from them in the past) so we toured round and looked at a number of other spots – flats, beaches, mangroves, etc. The swimming and sunbathing was excellent but I only caught small barracuda on my lures, had a few unhookable bites from houndfish and landed a small captain fish from the surf but the excitement was yet to come. 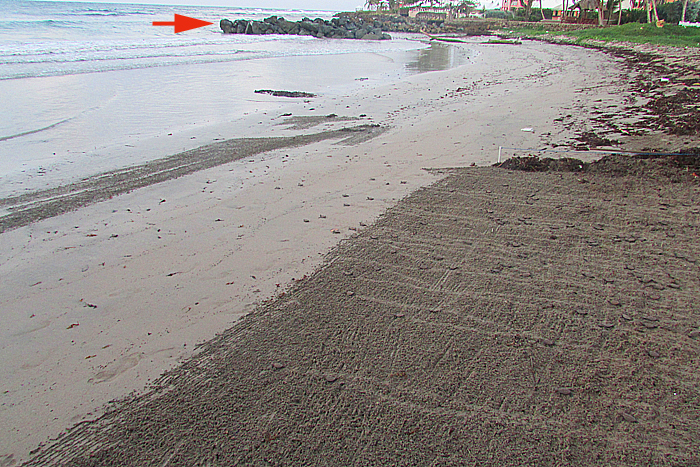 On the third day the weed along the hotel shore had cleared a bit but the sea was still rough. I decided that my best bet was to perch on the coral boulders at the end of the sandy beach so that I could cast into relatively weed-free water. Gingerly I inched my way out along the rocky walls (protecting small ‘swimming pools at the end of gardens) until I was perched precariously on a huge block of coral with the waves crashing up my legs. I cast a few times and only picked up weed once or twice. I cast again and I could see the Chase plug wiggling back towards me in the clear water. It was almost under the rod tip when a bar of silver flashed across its path and I was in! A decent tarpon sprang into the air furiously shaking its head before crashing back into the sea and tearing away against a tight clutch. I was already wondering how I might land the fish as there was no chance of getting down to water level (without broken bones and lesions) from where I stood. Time and again the tarpon made strong runs, each one ending in a glorious leap. As the fish began to tire I had to steer it away from the boulder wall, because the slightest contact between coral and line would have been curtains. Before I began fishing I’d noticed a slight gap in the wall leading into the swimming pool on my right. The larger swells were breaking through the breach into the pool. I decided to try and guide the tarpon through the gap into the calm water. With only one or two worrying moments I managed it but the fish was still lively and twice more it jumped clear of the water. The fish was tired now but because the tide was fairly high there was nowhere to slide it ashore except the stone steps that led down from the garden to the pool. I inched my way back from rock to rock until I stood on the steps. With a spot of fiddling I managed to get the head of the wallowing fish onto the bottom step. What now? Care was needed. By lifting with each swell, in a couple of minutes I had most of the tarpon’s body onto the steps. Carefully I took the lower jaw in my left hand, cupped my right hand under the wrist of the tail and lifted it ashore. Success! I removed the hooks and ran back to rouse Lilian from her sunbathing by the swimming pool so she could take a picture. 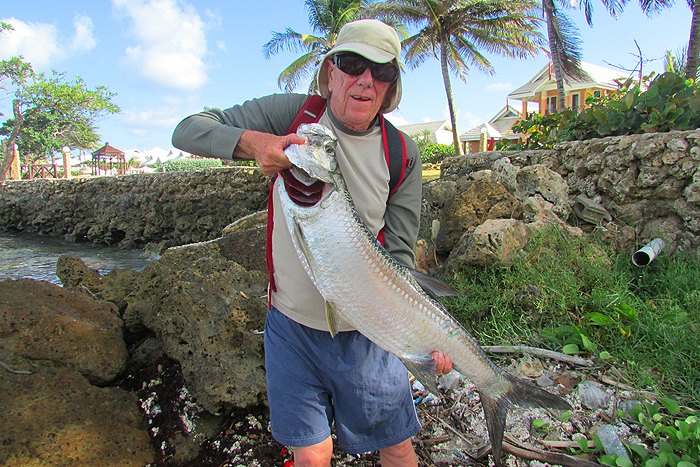 Then I lugged the tarpon – a twenty-five-pound baby – down to the water and nursed it back to life. After a minute or two it shot away with a flick of its great forked tail. As the holiday neared its end I was feeling well pleased with my catches. On our last evening I decided to have one last try from the hotel beach before dinner. It was dusk and I found that, at last, the weed had cleared completely. I made long casts using my biggest Yo-Zuri Slider and retrieved as fast as possible. On perhaps the tenth cast the lure had just reached the breaking surf a couple of yards out when the water boiled and it was hammered by a jack. The battle was short and not so sweet with the fish taking perhaps 150m of line in a single, fast, unstoppable run before the wire trace parted at the swivel. Ah well, it was my own fault for not rechecking the knot before I began to fish - silly old man - and I’ll never forget that amazing run. Magdalena lily pond - holds good snook and decent tarpon. 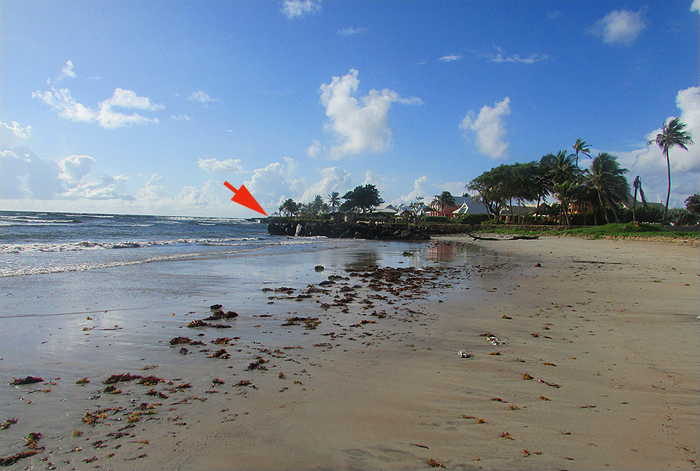 Magdalena beach - big jacks and the arrow shows where I stood to hook my tarpon . 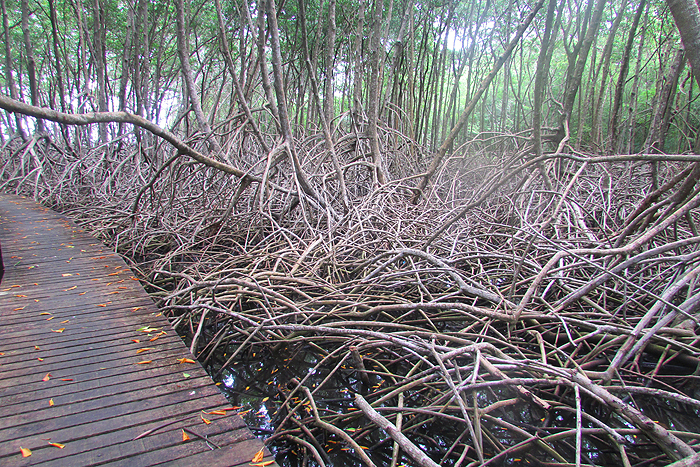 Magdalena boardwalk - mangroves with lots of birds, crabs and at times tarpon? Good jack caught from a blitz. The tarpon landed in the swimming pool. 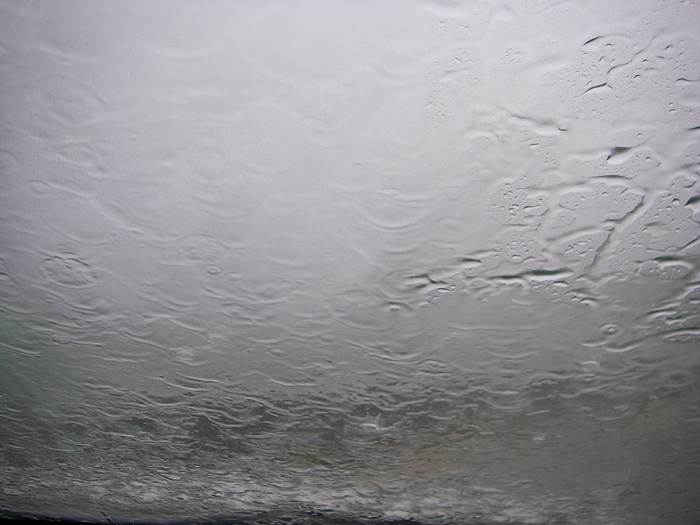 View from inside the car - well it was the rainy season. 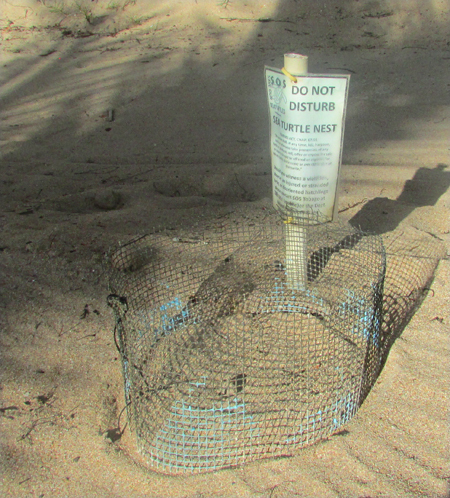 One of many loggerhead turtle nests on Magdalena beach. 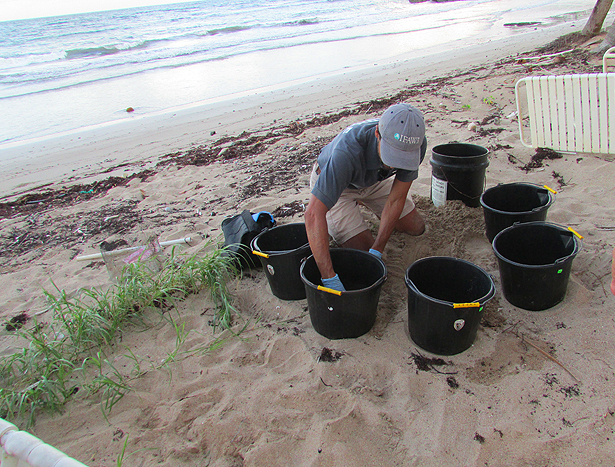 Removing baby turtles from a nest for release. Heading for its first swim. 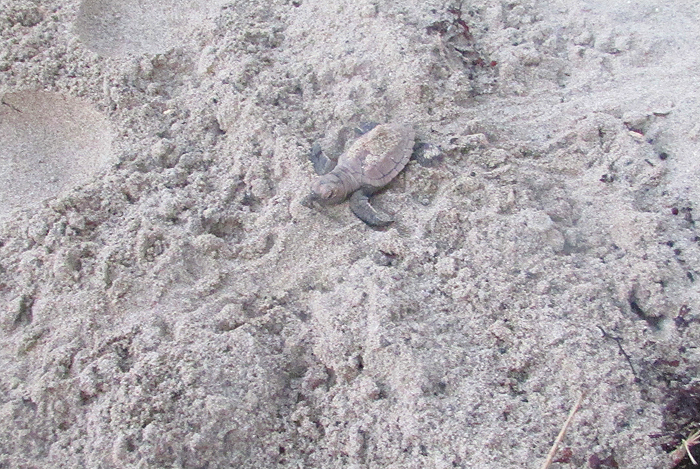 Baby turtles on the way to sea at low water. (Swimming pool rocks again arrowed).